It’s been a little over a year since Makerbot introduced their new line of printers, and since then there have been grumblings about the quality of the Smart Extruder that each one of these printers comes with. While there is no 3D printer extruder that will not eventually clog, wear down, or otherwise break, there are reports of the Makerbot Smart Extruder failing in only hundreds or even tens of hours of use. Considering that a single large print can take a dozen or so hours to complete, you can easily see the why the Smart Extruder is so despised and why even the availability of a three-pack of Smart Extruders is a joke in the 3D printing community. Of course a cheap shot at Makerbot that plays right into your preconceived ideas and prejudices is far too easy. We’re here to solve problems, not just state them, so here’s what we’re working with: to quantify the long-term reliability of 3D printers we need a way to measure the mean time before failure of extruders. This is already a solved problem; it’s just not implemented. On aircraft and some very expensive engines that power things like buildings and ships, there’s one gauge, tucked away in the control panel, that keeps track of how long the engine has been running. It’s called a hobbs meter, and the idea behind it is extremely simple – when there is power going to the Hobbs meter, it counts out hours on a small clockwork display. The resolution of the display is only tenths of an hour, usually, but that’s good enough for scheduling maintenance and to be mentioned in NTSB accident reports. Spend enough time with a 3D printer, and you’ll quickly realize the ‘estimated print time’ is merely a ballpark, and with failed prints the ‘total print time for this object’ isn’t exactly a perfect measure of how many hours you’ve been using your extruder. Only by directly measuring how many hours are logged on a hot end or how many kilometers of filament have been sent through an extruder will you ever get an accurate idea of how long an extruder has been running, and how reliable a printer is. Hobbs meters are available from Mouser, but you’ll be overpaying there. The better option is from a vendor in a different niche; $30 for a meter that can connect directly to the extruder heater. If enough people add this and keep proper logs, there’s a slight chance of improving the state of 3D printers with real data and not the prejudices of people trying to justify their own designs and purchases. But perhaps that’s too hard; adding a $30 item to a printer’s BOM just for the sake of data is a bit much. Luckily, there’s an even simpler solution that won’t cost a dime. Just measure the time a heater has been on in the firmware, or save the total length of extruded filament in a microcontroller’s EEPROM. Every printer firmware out there, from Marlin to Repetier to Sprinter has in it a way to calculate both the length of time a heater has been on or how much filament has been pushed through a nozzle. Secondly, if we’re not going with mechanical Hobbs meters there would need to be a ‘total time heater on’ or ‘total length of extruded filament’ variable in the various firmwares. There would hopefully be standardized Gcodes or Mcodes to read and reset this variable. Will this happen? Of course not. Organization isn’t a strong suit of the RepRap project, and any company that implements Hobbs meter functionality will probably lock that up in proprietary obfuscation. 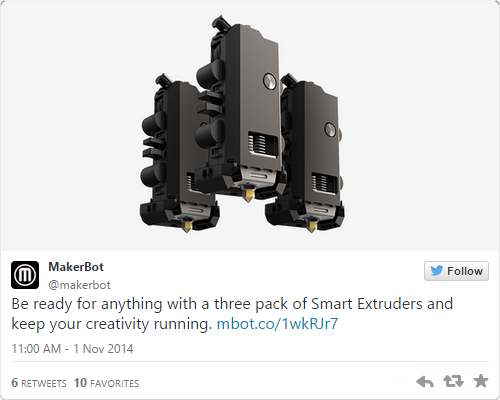 However, Makerbot isn’t dumb, and given they’re selling three-packs of extruders, I would bet they have some data on the MTBF of their extruders. A community-based measurement of the most common cause of broken printers is certainly possible, but like all problems it’s one of organization, not technology. 3D Printering is a semi-weekly column that digs deep into all things related to 3D Printing. If you have questions or ideas for future installments please sending us your thoughts. [Matt]’s 2008 Subaru’s stereo wasn’t really cutting the mustard for him anymore. He wanted to do something, something a little more custom than just an aftermarket stereo. After giving it some thought he decided he would try to mount an Android tablet in his car’s dash to act as a media player. The HTC Evo View tablet appeared to be a great size to fit in the space left over from the stock radio, and it did fit nicely but there was a problem, the AC vent was in the way of the headphone and USB jacks! This was only a minor inconvenience for [Matt]. Instead of butchering the AC vents he decided to disassemble the tablet and see what the other options were. Luckily for him, both the USB and headphone jacks were on their own PCB boards. A quick slot cut in the rear tablet case allowed both connectors to now face towards the front of the car into the gaping crevasse the stock stereo once filled. Since the manipulated tablet case was facing inside the dash it wouldn’t create any unsightliness for the passengers. With those connections out of the way it was time to focus on mounting the tablet in the dash. The stock trim panel that housed the old radio and two AC vents was modified with a hand-made fiberglass bezel to fit the tablet screen and make it look like the car came that way. The bezel was sanded smooth and painted to match the rest of the interior. Originally, [Matt] had to turn the tablet both on and off when starting and stopping the car. He then stumbled upon a product called the IOIO. The IOIO allows an Android device to interact with the inputs and outputs; both digital and analog, I2C, SPI and UART. It even has a voltage regulator that can take the car’s 12v supply and knock it down to 5 for the tablet. [Matt] also connected the IOIO to the car’s ‘ignition on’ circuit to turn the unit on and off with the car. [Matt] plans on doing more with the IOIO’s capabilities in the future, but until then, he still has a pretty nice looking and unique car stereo.